The American pit bull terrier may have a bad reputation, but under all that muscle is a heart of gold. Learn more about what makes this misunderstood dog so lovable. 1. They come from violent beginnings. Pit bulls were bred for a brutal lifestyle in Great Britain. The bulldog was crossed with either the white English terrier or the black-and-tan terrier to create powerfully-built dogs for fighting. Blood sports such as bull and bear baiting were popular in England as early as the 1200s. Dogs would enter pits and fight the giant animals for entertainment (hence the name). When baiting became illegal in England in the 1800s, pit bulls were turned on each other and illegal dog fighting became prevalent. 2. As a result, they have a bad rap. These dogs were bred to be strong and fearsome, and as a result, have a reputation for being dangerous. The type of dog is banned from Denver, parts of Florida, and even whole countries like Great Britain and New Zealand. Fortunately, the tide is changing for the misunderstood breed, and many cities are reconsidering their ban. 3. American pit bull terriers fall under the "pit bull" umbrella. Pit bull is a type of dog, but the American pit bull terrier is a breed. Other breeds that fall under the term pit bull include the American Staffordshire terrier, the American bulldog, and the Staffordshire bull terrier. All of these breeds derive from the dogs originally bred to fight in the pits in England. 4. The American pit bull terrier is not an accepted breed by the AKC. 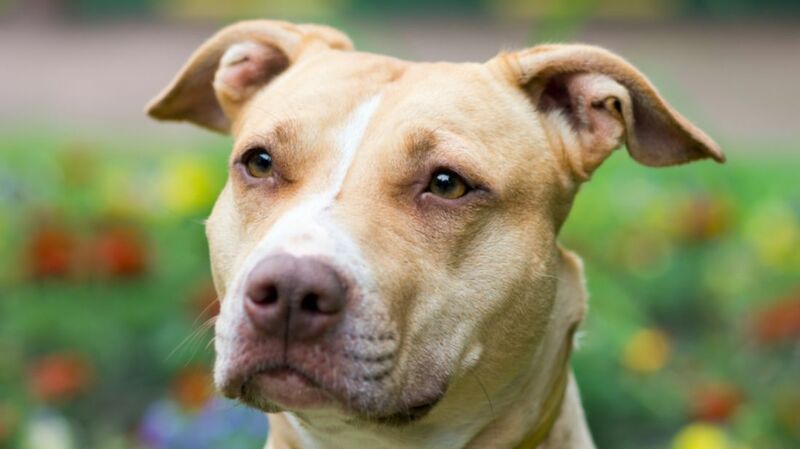 The American Kennel Club does not recognize the American pit bull terrier, but it does acknowledge an extremely similar breed called the Staffordshire terrier. This name distinction was created in an effort to separate the breed from its negative past. 5. The breed has been through a number of name changes. The AKC wasn't the only group to attempt a rebranding. In the '90s, San Francisco tried to change the dogs' name to St. Francis terriers. In 2004, the New York City Animal Care and Control tried to rename the dogs “New Yorkies.” According to director Ed Boks, "New Yorkers, like pit bulls, are sometimes perceived as a standoffish and mean breed—but are actually some of the most generous and open-hearted people I've ever met." Sadly, the plan was a flop. 6. They were once the American family dog. American pit bull terriers may need some PR help nowadays, but there was a time when the breed was America’s favorite. Petey, the canine companion of the Little Rascals, was a pit, as well as Nipper, the RCA dog, and Tige, the Buster Brown shoe mascot. 7. Snoop Dogg loves them. The famous rapper loves the breed so much, he once had a kennel of 20 pit bulls while living in Claremont, California. 8. One photographer aimed to put them in a better light—with flowers. To showcase the softer side of pit bulls, photographer Sophie Gamand photographed a number of dogs with soft pastel colors and floral crowns. The combination of doe-eyed dogs and beautiful flowers make the pups impossible to resist. 9. They make good bandmates. Caninus (pronounced kay-nine-us) was a pit bull-fronted grindcore band. The two lead singers, female pit bulls Budgie and Basil, would “sing” by barking. The group even made a split EP with a band called Hatebeak, which featured an African Parrot vocalist. 9. The army used the pit bull as a mascot. World War I propaganda posters would adopt the images of dogs to symbolize different countries. Germany was represented by the dachshund, England by the bulldog, and the United States by the pit bull. Respected for their loyalty, determination and bravery, they were considered the ideal candidate. When properly socialized and trained, pits can be some of the friendliest dogs you’ll meet. While you should never say hello to a dog you don’t know without first asking its owner, pit bulls are naturally warm and kind-hearted canines. Keep in mind that every generation has a dog that it has decided is dangerous. In the 1800s, it was the bloodhound. Often dogs with bad reputations are guilty of the most dog attacks because they are bought, and trained, for the purpose of being aggressive—not because they're inherently so. Any poorly-trained dog can be violent; shower yours with love and attention, however, and you'll be rewarded with a cuddly, loyal companion. Interested in adopting? The Merit Pit Bull Foundation is a good place to start.